So there you have it. Democrats like Center for American Progress president Neera Tanden who have been cheering for Assange’s arrest have actually been cheering on the Trump administration’s prosecution of a journalist for publishing facts about Bush administration war crimes. They thought they were supporting the agenda to punish Assange for publishing leaks that hurt the Hillary campaign, but in reality they were defending two Republican administrations while helping to manufacture support for a prosecution that would set a devastating precedent for press freedoms throughout the entire world. That’s right, she flat out lied about it. On last night’s episode of MSNBC’s most popular show, Maddow blatantly deceived her audience by weaving this story about the Chelsea Manning subpoena into her conspiratorial Russiagate ramblings about Roger Stone, despite those stories having absolutely nothing whatsoever to do with one another. Maddow began by gushing about investigations into Roger Stone’s alleged connections to WikiLeaks, of course not mentioning the fact that the only known interactions between Stone and WikiLeaks consist of WikiLeaks telling Stone to stop lying about having connections to them. Maddow smoothly weaved this into the news that the House Judiciary Committee has formally requested documents pertaining to WikiLeaks (among many other things) from dozens of Trump associates, with a gigantic grin on her face and a tone of immense significance in her voice. 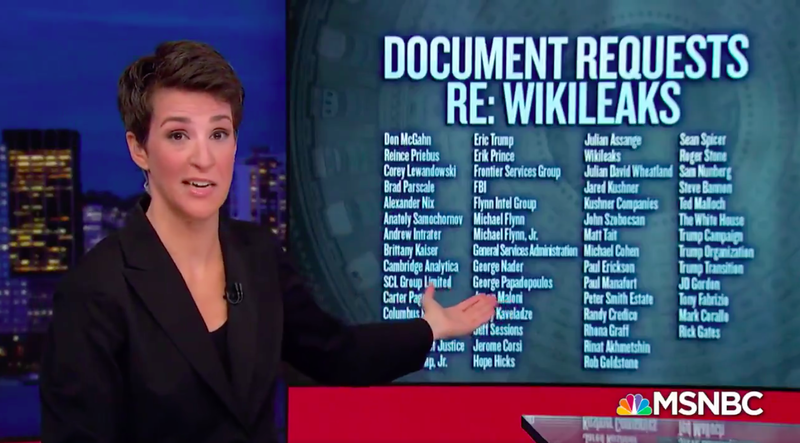 Then, without pausing, Maddow began talking about the sealed case against Assange and the Manning subpoena, falsely suggesting that these had something to do with the things she’d just been speaking about. Maddow then went on to describe November’s revelation via court filing error about Assange’s sealed criminal complaint with her trademarked conspiratorial “you can’t tell me this is a coincidence” histrionics. She then cited a Daily Beast report that former WikiLeaks volunteer David House had accepted an immunity deal in exchange for his testimony before this grand jury, completely omitting the fact that the report explicitly states that this testimony pertained to the 2010 leak drop and not anything to do with 2016. So she just plain lied. By suggesting that the Virginia grand jury has anything at all to do with Roger Stone’s walking clickbait shenanigans, the House Judiciary Committee’s investigations into possible Trump malfeasance, and Cohen’s testimony that Trump had advance knowledge of the (already publicly announced) upcoming WikiLeaks drops, Maddow knowingly deceived her tinfoil pussyhat-wearing audience into holding out hope that legal proceedings will soon be vindicating their cult. Maddow then kicked it up into ultra-mega-Super-Saiyan-galaxy-brain Russiavaping by telling her audience not to Google any of the things she was telling them, because they’ll get computer viruses if they try. Needless to say, this also is completely false. Google algorithms are slanted in favor of mainstream news media, not toward websites that will give you a “virus”, so the top results you get when you type in WikiLeaks or Assange’s name will always be news stories from conventional sites, many of which today refute Maddow’s claim that the Manning subpoena and grand jury have anything to do with the 2016 Trump campaign. And of course, that’s the point. Narrative management is Rachel Maddow’s job, for which she is extremely well-compensated, and the more isolated she can keep her audience within a tight, narrow echo chamber, the better she can do that job. Rachel Maddow is nothing other than a cold war propagandist, rewarded like all her colleagues for promoting falsehoods to keep mainstream liberals supporting longstanding US government agendas against noncompliant nations while still letting them feel like rebels. In today’s media landscape, powerful and opaque government agencies are scrutinized and criticized far, far less than a lone political prisoner in an embassy who revealed inconvenient facts about those agencies. The campaign to smear, silence and imprison Assange tells you all you need to know about the governments that WikiLeaks has exposed, and the mass media’s complicity in that campaign tells you all you need to know about them as well.